Platelets are not only central actors of hemostasis and thrombosis but also of other processes including inflammation, angiogenesis, and tissue regeneration. Accumulating evidence indicates that these “non classical” functions of platelets do not necessarily rely on their well-known ability to form thrombi upon activation. This suggests the existence of non-thrombotic alternative states of platelets activation. We investigated this possibility through dose-response analysis of thrombin- and collagen-induced changes in platelet phenotype, with regards to morphological and functional markers of platelet activation including shape change, aggregation, P-selectin and phosphatidylserine surface expression, integrin activation, and release of soluble factors. 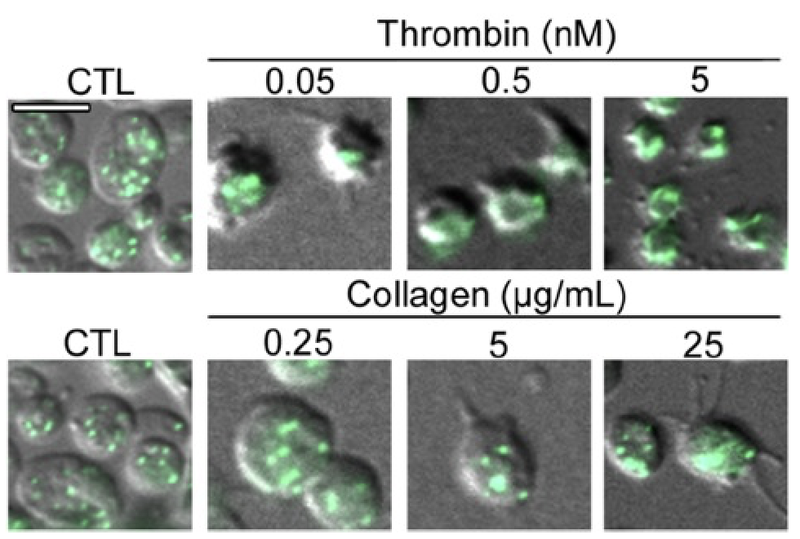 We show that collagen at low dose (0.25 microg/mL) selectively triggers a platelet secretory phenotype characterized by the release of dense- and alpha granule-derived soluble factors without causing any of the other major platelet changes that usually accompany thrombus formation. Using a blocking antibody to glycoprotein VI (GPVI), we further show that this response is mediated by GPVI. Taken together, our results show that platelet activation goes beyond the mechanisms leading to platelet aggregation and also includes alternative platelet phenotypes that might contribute to their thrombus-independent functions.